Nobody feels safe when they notice that something is wrong with their garage door. If you are looking for fast and affordable garage door repairs in Woodland Hills, you can count on us. We have been in business for more than a decade, and we have the experience and skills required to offer all our customers fast and dependable repair service. We specialize in repairing and replacing all types of garage doors and parts, including well-known brands such as Chamberlain, Genie, Craftsman and more. No matter what kind of garage door you have, we can provide you with top service to have it up and running again in no time. The springs of a garage door are sometimes the first to break, mostly because of the tension that is put on them on a daily basis. When you notice that something is amiss with your springs, get in touch with us and our team of knowledgeable experts will be able to diagnose and repair the problem as quickly as possible. We cover both torsion and extension springs and our service is quick and reliable so you know you are always in good hands. We guarantee the best repair service for garage openers. All of our technicians are trained to offer you any opener repair service, no matter the make and model. We are aware that time is often critical when it comes to door opener trouble, so we aim to have everything back in working order the same day. 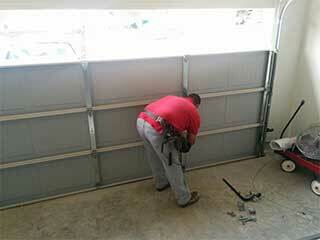 For garage door repairs, you can always count on Garage Door Repair Woodland Hills. No matter the type of repairs, look no further than our experienced team.